Professional activities performed in a state of distraction-free concentration to push cognitive capabilities to their limit. These efforts create new value, improve your skill, and are hard to replicate. Newport, an assistant professor of computer science at Georgetown University and the author of the blog Study Hacks as well as the book So Good They Can’t Ignore You, has written a new book titled Deep Work: Rules for Focused Success in a Distracted World. Reading Deep Work this week was a perfect continuation and expansion of the thoughts that I expressed in my blog on June 13, “Data Visualizaton Lite,” for a lack of deep work is probably the reason why most recent work in the field of data visualization is splashing around in the shallows. I believe that Newport’s hypothesis is valid. Over the years I have written and spoken many times about the importance of slowing down and thinking deeply, over an extended period of time, as the path to understanding and also to a fulfilling professional life. I work hard to create space for regular deep work. It is for this reason that I have always avoided all forms of social media (Facebook, LinkedIn, Twitter, etc. ), for it offers me little compared to the overwhelming distraction that it would create. During much of my professional life I struggled to carve out opportunities for deep work in organizations that were not designed to support it. Founding Perceptual Edge made it possible for me to design a workplace and schedule that supports the deep work that makes me happy and productive. 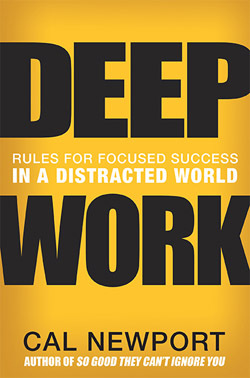 In this book, Newport explains what deep work involves, why it’s important, what makes it so difficult to experience among today’s knowledge workers, and how these difficulties can be overcome. Newport’s insight that deep work is needed is not new, but what he’s done with this book is. He has exposed the problem and prescribed its remedy in a way that perfectly fits our current, technologically “connected” world. If you struggle to reach your cognitive potential as your mind flits from shallow thought to shallow thought, frenetically busy but not productive, I recommend that you read Deep Work. There is much to say about social media. I, like you, value deep concentration, but I see a platform like Twitter as a public note-taking tool (instead of saving links in my own browser favorites, I make them public,) and as a discovery device, not as a way of wasting time or getting distracted. Newport does not argue that social media tools such as Twitter cannot be useful to some people for some purposes. As you know, I don’t find Twitter useful at all for my work. I take notes in other ways. I don’t choose to make my notes public and don’t believe that they would provide any public value. Perhaps your thoughts in the moment are more fully formed than mine. I prefer to work on ideas for a while before making them public, so that when I write about them, they are clearer, more thorough, and more useful. I’m curious. When you read tweets made by others, what portion of them are worth your time compared to other activities? I’m asking because I find it hard to imagine that more than a small fraction of tweets would be worth my time. 1. Read the print New York Times, and other periodicals, when they arrive: 45 minutes more or less very early in the morning. 2. Right after, check my RSS feed: 2 minutes, plus the time of reading any article I deem interesting. 3. Check Twitter feed: 2-3 minutes, plus the time of reading any link that looks worth the time. I check Twitter briefly three or four other times a day, but that is just because, as a journalist, I consider it a good relaxing activity in between much longer periods of “deep concentration”. And, as I said, I also use it to post links that I want to save for some reason. Instead of putting them just in my computer, I link them there. Studies show that we tend to dramatically underestimate the amount of time that we spend in activities such as social media. Whether that’s true in your case, I certainly can’t say, and it really doesn’t matter. Newport’s point and mine is that people struggle today to do “deep work,” assuming they attempt it in the first place, and that social media and current organizational culture tend to flood our lives with shallow activities. You may be an exception. “Deep work” takes time. Reading twitter doesn’t (or doesn’t have to). I don’t know about you, but I can’t just sit down and start doing “deep work”. It usually takes me about 10-15 minutes to fully immerse myself to achieve the level of productivity that makes it worthwhile. As such, I want to make the most of that time. When I know that I have several hours at my disposal for “deep work”, I do “deep work” – I’m not distracted by social media. But when I get home from work and know that I have just 10-20 minutes before my wife and kids get home and I have to make dinner, or when I’m early to an appointment, or when I’m at a family gathering and preferring to hide out in my phone instead of having to repeatedly answer people asking me, “So, how’s your day job going?”, I don’t even attempt to do “deep work”. Why would I? That ramp-up time will just be a waste. I find way more value in connecting with people on social media in those short windows. I would say it’s absolutely worth my time. Even though I don’t find social media useful, I don’t doubt that you and many others do. I also don’t doubt that social media can be managed in a way that doesn’t conflict with deep work. It is absolutely true that deep work is something that we usually cannot shift into instantaneously. As you indicate, it usually takes time to transition into deep work. I’m not in agreement with all of it, but it’s worth it as a companion piece. Thanks Nate. This book does look worthwhile.